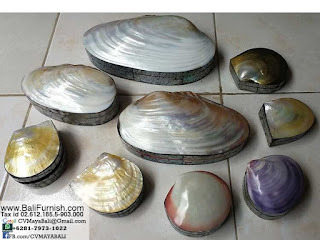 Sea shell boxes from Bali Indonesia. Various boxes made of sea shell in various sizes, small to large. This is very popular. Small shell boxes to use as jewellery boxes or trinket. These clam shell boxes is one of our best seller. Good product to sell in your stores or shops. Our shell boxes is perfect to use as wedding souvenirs or gifts for your friends and families. Photo above show you our shell boxes made of various kind of sea shells including mother of pearl shell both gold lip and black lip. Other than that, you can see also small shell box made of blue shell. We can make also this kind of box from clam or Scallop shells. These boxes also possible to hold your wedding rings, as a Coin Purse also possible. Please remember that due to product nature, color variations might occur, the sea shells boxes might have a different color from stock photo. All of our shell crafts are made to order. We recommend you to place the order in at least four weeks advance.